I beg your indulgence, but once more I feature Carl Sandburg’s words in today’s piece. Variety is a goal here, so perhaps I need to take a personal no-Sandburg pledge for a decent interval. And, honestly, I wasn’t seeking another Sandburg piece when I read through a yearly anthology of American poetry from 1922 last week, looking for fresh public domain material. Reading it I came upon the interesting poem that is the basis for today’s piece. 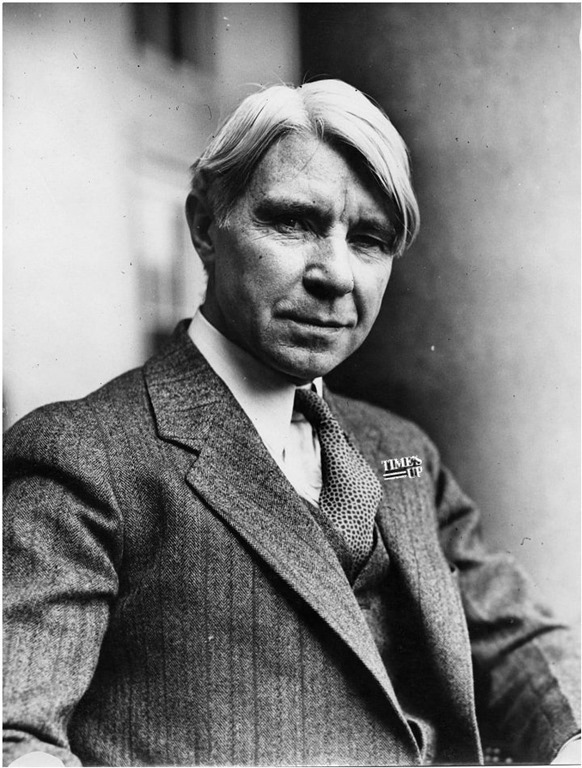 The younger Carl Sandburg. Prophet? Besides variety, I like to see connections, and “California City Landscape” is rich in that. As a poem it may not be as sharp and condensed as Sandburg’s Imagist poems that I like to call attention to, but it does bring to the table Sandburg’s youthful journalism. “California City Landscape” starts off like a feature story, and the story it tells is like ones written about gentrification in the 21st Century, even though it was written no later than 1922. The incumbent residents may be displaced. But like a poem, or a piece of carefully written prose, the reportage includes sentences which send a reader or listener off into entire dimensions of reality outside its moment in “the peace of the morning sun as it happened.” It was those things that arrested my attention as I read this in the midst of this old annual anthology. But there it is in a sentence. An Irish-American, coming from a nation that is widely despised, colonially oppressed, and mired in poverty and starvation, travels in a generation across and ocean and a broad continent, and in the process shoots (and presumably kills) indigenous Americans, an act linked as if it was like hunting for food. I’ll admit, at first moment I thought it offensive, but I’ve read enough Sandburg to know his toughmindedness, his instinct to not sugar-coat. That Sandburg wouldn’t have included this detail as a thoughtless, bloodless, “Oh, those good ol’ days, when men knew how to handle a rifle” comment. His next anecdote: two Japanese families, truck gardening for the growing city of Los Angeles. And once again, the undertone: immigrants whose race and culture is understood barely enough to be widely disapproved of in their new country. We don’t need to credit Sandburg with the gift of prophecy, but historically we may know what will happen in 20 years: the Japanese Americans on the West Coast will be taken from their homes by legal fiat and detained in makeshift rural camps. So, a 95-year-old poem about a problem we might write about today (if our poetry would be politically engaged and socially observant): gentrification. And in talking about it, Sandburg brings in racism, and immigration from those, ah, um—what’s the Presidential term—oh, yes, less desirable countries. And then the third anecdote: the McMansion of the Hollywood director, with the “whore-house interiors.” Here I’m not completely sure about Sandburg’s prophetic dimension. The epithet of whore-house décor remained even into my time in the second half of the 20th Century as a charge on nouveau riche ostentation, a term used without a direct linkage to sexual oppression. Maybe I’m missing an obvious alternative, but is Sandburg predicting a 95 year #timesup statement? Musically, I’ve been a little short of time. I wanted to do something reminiscent of the mid-20th Century word-jazz bag, but the typical beat poet reading to jazz backing in a small club used piano, and my piano skills are entirely rudimentary. Frequent Parlando Project keyboardist Dave Moore is currently fighting a right hand issue, so I couldn’t go that route, so I used by love of jazz guitarist Jim Hall and my audacious tendency to fake styles beyond my abilities to create this jazz trio with drums, bass, and electric guitar for my reading of Sandburg’s “California City Landscape.” Hear it using the player below.